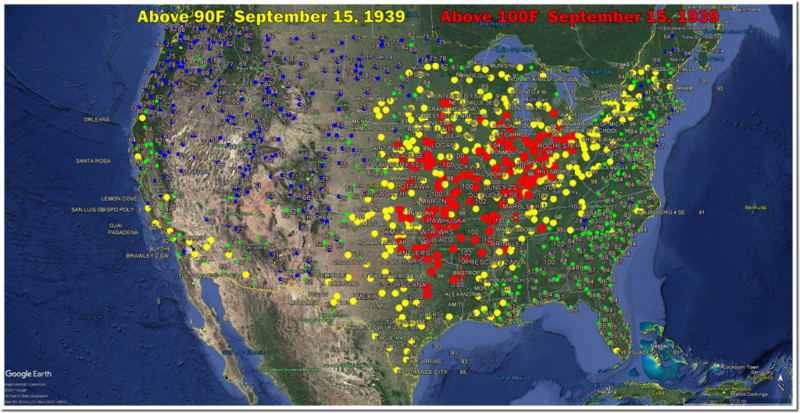 Prior to 1960, September 15 was a very hot day in the US, but September 15 temperatures have plummeted over the past century. On this date in 1939, every Midwestern state was over 100 degrees. 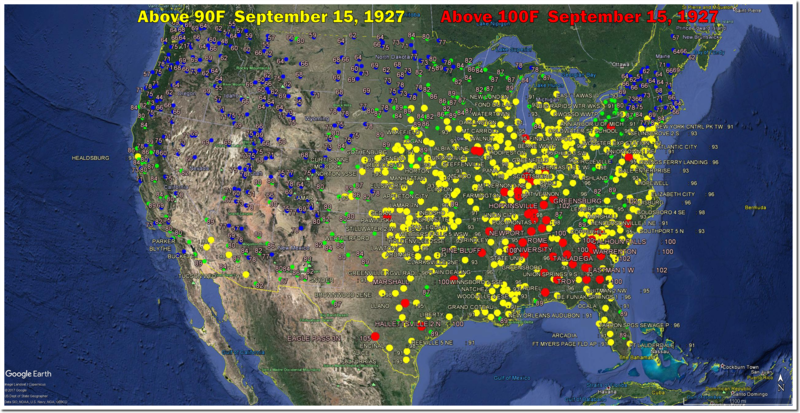 On this date in 1927, 100 degree temperatures extended all the way to Pennsylvania. 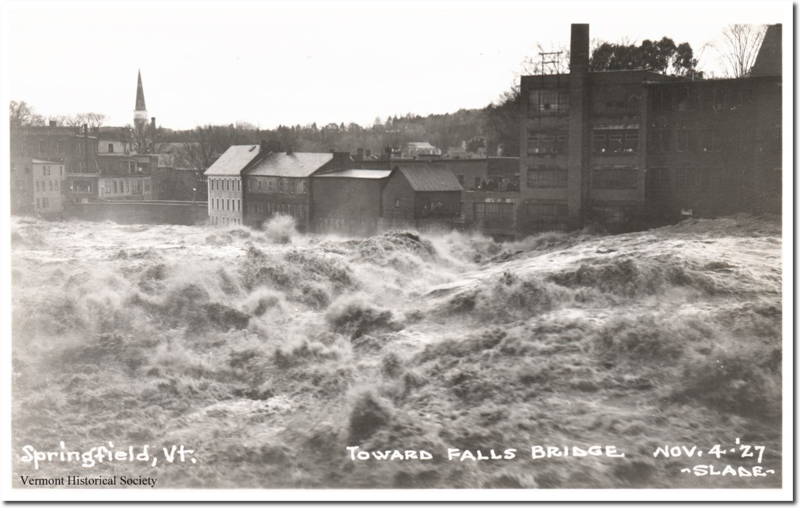 1927 also brought the worst floods in US history to the Mississippi Valley and New England. You won’t hear about any of this in the press, because their job is to push climate fraud – not report facts. Listening to the radio weather man where I live, he stated that we will be approaching a record!!!!! this weekend at 28C. He then went on to say the actual record is in the 30’sC without being specific. So in reality we will be 3 or 4C below the record, or in real terms, not even close. Nothing but hype. I find it remarkable how anyone could see these daily temperature charts and say there is some warming trend. They look like a seismogram. Not that this is abnormal or anything this time of year, but a late summer snowstorm? IDAHO FALLS — A winter storm warning has been issued for much of southern Montana this weekend. The National Weather Service reports some 8 to 14 inches of snow is possible above 7,000 feet. Officials say travel in high country could be difficult and tree and power line damage is possible. considering that there is no more sea ice in the superhot arctic one may wonder where all this cold can come from to create a snowstorm-especially as it is still summer time till sept. 22nd on the hottest planet in universe?? On the other hand: when contradictions are the rule and nothing adds up it usually called science meets global warming and proof of whatever. Winter was slow leaving the same area last JUNE. 2046 was for sure the warmest shortest long winter ever – i guess. Most people just did not realise how hot June was as they were to busy with freezing and paying lots of money for heating. Looks like arn hijacked one of the hockey team’s time machines. “A power outage knocked out” the very pumps that were designed to drain the city. Hmmm…. 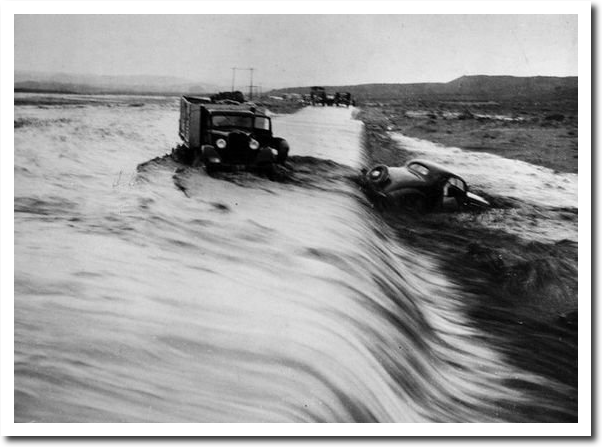 by 1927 we had submersible pumps that operated under water, and we knew how to run submersible power cables, and we knew how to build gasoline-powered pumps. So what was the problem? Were the people of New Orleans unaware of this? Sometimes things don’t need to be unnecessarily complicated and these daily records are a fine example. 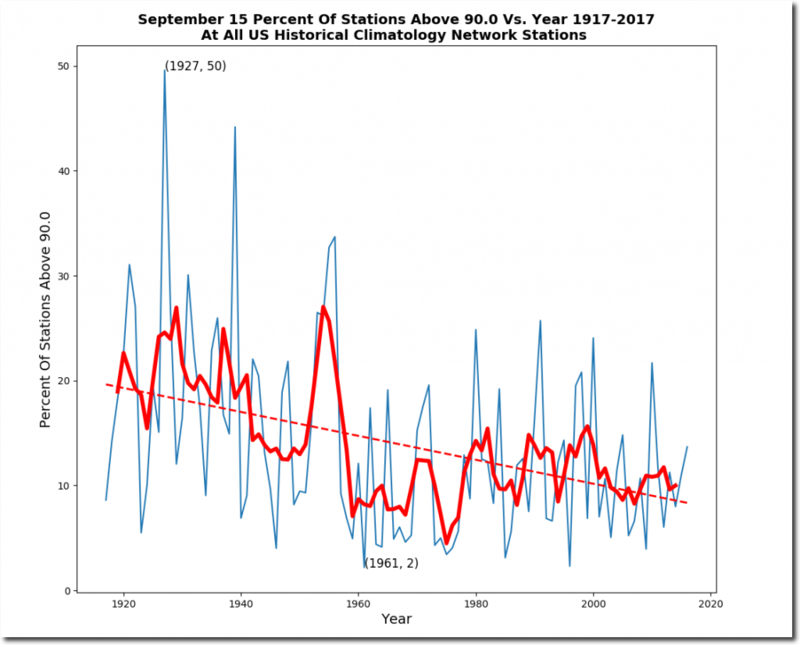 The world’s best climate data has consistently revealed the Big Climate Lie in all its glory without any fuss or drama. 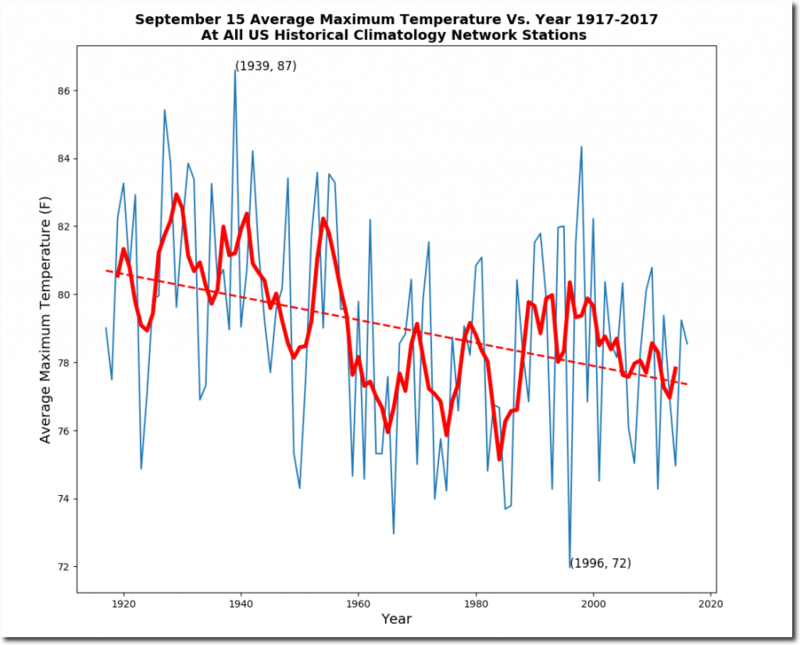 Just look at a years worth of individual date records going back as far as temperature records allow and it’s a question of…what warming? 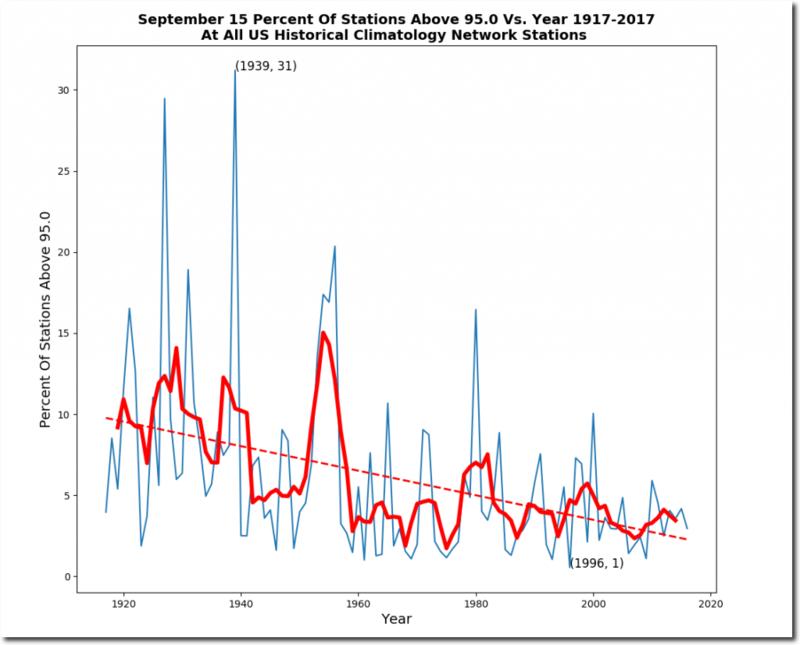 These daily records show a clearly declining long-term trend, absolutely zero warming trend and no correlation whatsoever to atmospheric CO2 levels. They’re simply impossible to refute. So simple, so clean and so true! The sceptic movement should be using this information far more so than they are doing, as it’s absolute Kryptonite to alarmists. 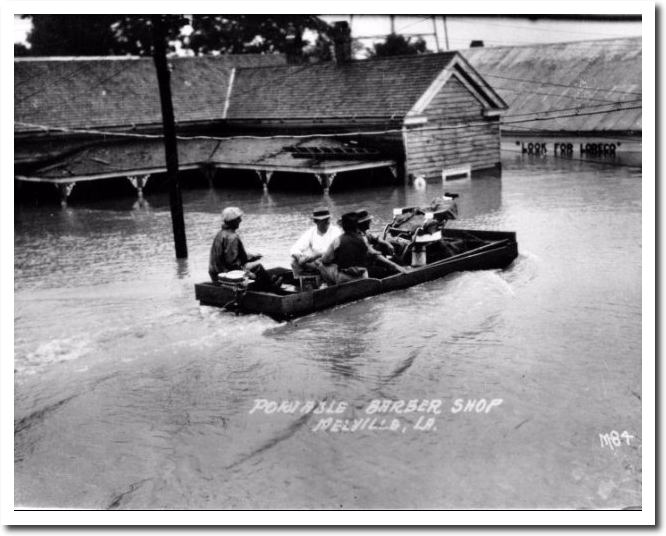 1927 disasters were make believe disasters, not climate science approved disasters like Harvey and Irma. Tony, are there any other daily records from around the world going back to the 1900’s? A repeat of these US conclusions on a global spread, eg the UK, Europe, Australia and a couple of other locations, could create a very big problem for alarmism.